This Honolulu International Center Card held on September 24, 1969 featured the first appearance of The Sheik in Hawaii and Pedro Morales defending his North American Championship against Curtis Iaukea. Prior to the main event, five other matches took place. In the first match, Ripper Collins defeated Rocky Hunter, Ed Francis defeated Killer Buddy Austin. Rocky Hunter attempts to escape from Ripper Collins' arm bar. A bleeding Ed Francis struggles to get back in the ring. Killer Buddy Austin delivers a knee to Ed Francis. 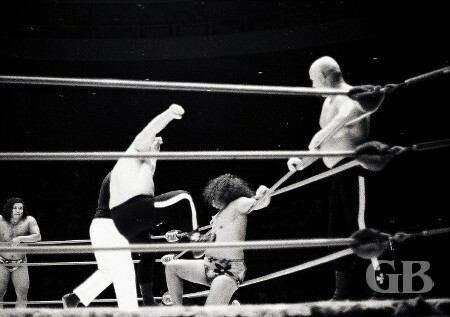 The match between The von Steiger Brothers vs. Neff Maiava and Peter Maivia ended in a draw as the match between Giant Baba and Gene Kiniski. The von Steigers have Neff Maiava tangled in the ropes as Peter Maivia watches. Peter Maivia works on one of the von Steiger's leg. Giant BaBa slams Gene Kiniski. BaBa applies the abdominal stretch on Kiniski. 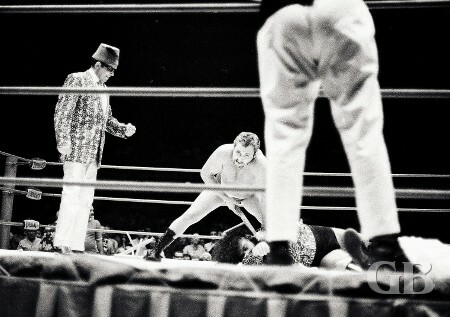 The Missing Link defeated The Sheik on a disqualification when The Sheik attacked both the referee and The Link with a wooden stool prior to the start of their match. 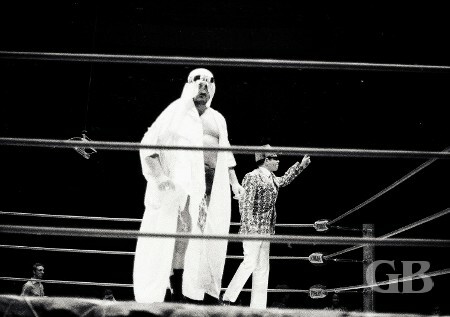 The Sheik walks around the ring with his manager Abdullah Farouk. 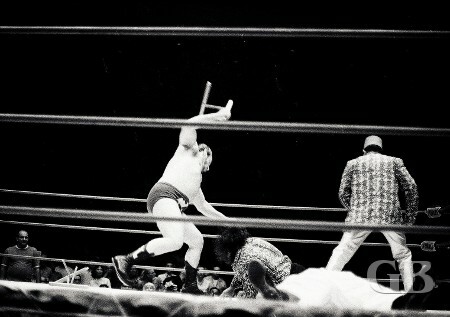 The Sheik attacks The Missing Link with a wooden stool as the referee lays knocked out on the mat. The Sheik chokes The Link with a stool leg while his manager watches. The Missing Link being helped out of the ring. The Sheik was disqualified for using a foreign object. 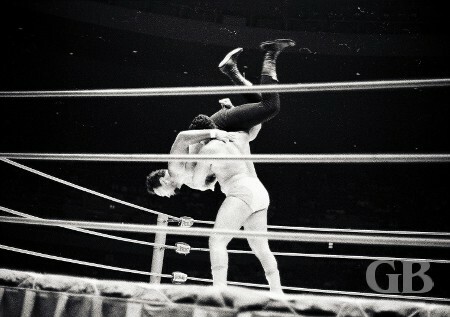 As soon as the bell rang, Morales attacked Iaukea and threw him over the top rope onto the floor and went after him. Morales then threw Iaukea into the steel post of the ring twice, then body slammed Iaukea outside on the cement floor. When Iaukea was able to return to the ring, Morales body slammed him on the mat followed by a knee in the throat and a press for the first fall in the time of 3:10. 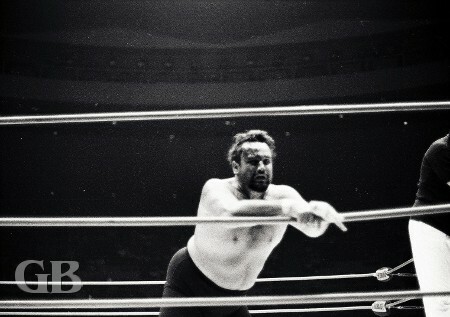 Pedro Morales slams Curtis Iaukea. Morales applies the Japanese Sleeper Hold on a groggy Curtis Iaukea. Iaukea evened up the match with a knee to Morales' stomach which put Morales on the mat. Iaukea then flew in mid air and used a big splash to end the second fall. Iaukea splashes Morales to win the second fall. 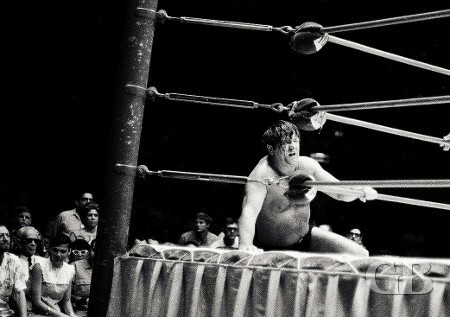 Pedro Morales' head is tangled in the ropes as Iaukea applies pressure. For the third fall, Iaukea had Morales stuck by his neck in the ropes and the fans went wild. 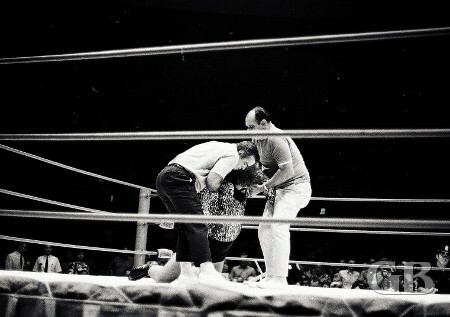 Both men were knocked down when Morales was released from the ropes. As both men were laid out on the mat, the referee began to count both men out. As the referee counted, Iaukea craled slowly over and put his arms on Morales. The referee counted 1-2-3 and the match was over. Iaukea had defeated Morales to become the new North American Champion in the time of 9:34. Morales about to slam Iaukea's head into the ring post. A battered Iaukea takes a breather.